This support, and the sustained pickets and rallies of teachers, students, parents, and other community members, forced the school board of the LA Unified School District (LAUSD) to concede considerable ground. Everywhere, the union placards of the United Teachers of Los Angeles (UTLA) were printed in both Spanish and English. The mass outpouring in favor of the strike also helped change the national conversation about the privatized charter schools that are eating away at public education. And just as the West Virginia, Oklahoma, and Arizona teachers’ strikes of 2018 paved the way for this one in LA, so the LA strike is very likely to be followed by major teacher strikes in Oakland, Denver, and other cities. Public schools are underfunded, overcrowded, lack adequate social services and are subject to the worst impulses of neoliberalism. These attacks on public education disproportionately affect poor students, students of color, immigrant children, students whose primary language is not English, and those with disabilities. 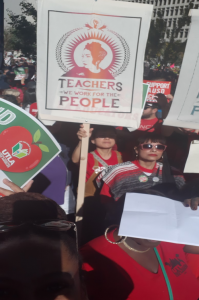 For months and years, LA teachers have been demanding a modest wage increase along with lower class size, accountability for charter schools, more support staff (nurses, counselors, librarians, etc. ), less standardized testing, re-investment in education programs, and a stop to random searches and policing of students. A previous strike in 1989 demonstrated how demanding only a wage increase was short-sighted. LAUSD did meet teachers’ demands in ’89 but also increased class size, cut down on support staff and programs, and heavily charterized the district. By 2014, a slate backed by progressive caucuses brought a new leadership to the UTLA. Moreover, the reinvigorated union lost hardly any members despite the reactionary Supreme Court decision making it harder for public sector unions to maintain their membership by making it “voluntary” even for workplaces with union contracts. As a result of the January 2019 strike, the teachers won something on all of these issues, although in some cases only marginally. The seven-day strike commenced on Monday, January 14, Teachers wore #redfored, in/with the spirit of their fellow teachers in West Virginia, Kentucky, and Arizona who had engaged in similar labor struggles in 2018. Teachers would report to their respective school site at 6.30 am and picket heavily during school drop-off. 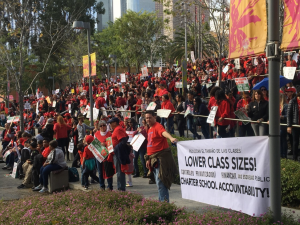 A daily rally was held in downtown LA at the LAUSD headquarters. After the rally, teachers would return to their schools to picket at the end of school. Other actions involved protesting at the homes of school superintendent Austin Beutner and Monica Garcia (one of the more obstinate board members). Beutner the new superintendent is an investment banker with no teaching or education administration background. He was also a deputy mayor under Antonio Villaraigosa and has ties to billionaire Eli Broad. Supporters from many political leanings joined teachers on the picket lines. 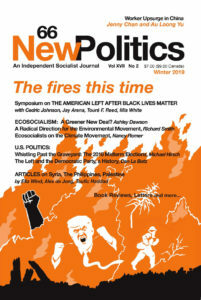 In particular, the Democratic Socialists of America (DSA)-LA, the International Socialist Organization (ISO), and Black Rose/Rosa Negra (BRRN) were among the leftist groups that were conspicuously in solidarity with teachers picketing and offering resources, while several from the International Marxist-Humanist Organization (IMHO) participated as individuals. Teachers also coordinated their strike activity with other labor actions across the city. Strike Day # 5 with Jason Torres-Rangel, LAUSD teacher, and activist. 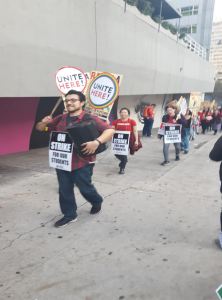 After a day of picketing schools, teachers marched some more to support a labor action at a hotel in Koreatown with Unite Here! At an elementary school in a mainly Latinx neighborhood in southeast LA, parents and community members, many of whom were Spanish speakers, sustained a daily teachers’ picket line by joining it and by offering food, drink, and a place to meet. A home near the school was volunteered as an impromptu strike headquarters, where teachers could rest, hold discussions, and get food and drink. At this school, both the teachers and the community were almost 100% Latinx. In the early days of the strike, the union representative announced that their demands for a raise had been won, but that they were holding out for other issues, that “We need to fight for the kids.” In this spirit, they stayed out another week in order to win some gains on issues like librarians, nurses, and reduced class size. A handmade sign by a young teacher stated: “I Miss My Students but I Love Them Way Too Much to Not Fight for Their Future.” Community members were solidly in support of the strike too, stating over and over again that “the kids are the future.” There didn’t seem to be a single parent who didn’t support the strike at a school where the teachers were also overwhelmingly Latinx. Intense picketing also took place at Augustus Hawkins High School in South Los Angeles. This school is comprised predominately of working-class Latinx students and is not unlike others in the district. Teaching has traditionally been a white middle-class female profession. Indeed, in a nation where 50% of the public school students are people of color, 80% of the teachers are white. These demographics are vastly different in the LAUSD, however, where Latinx educators account for 43% of all LAUSD teachers, with the rest mainly white, Black, and Asian. Finding themselves on the intersections of race, class, and immigration status, Latinx parents and students encountered at the teachers’ strike considered this struggle to be both an economic and racial justice matter and were very supportive of the teachers’ actions. Again and again, the Latinx teachers reminded attendees that the struggle was about students, their communities, and their futures. There was little emphasis on teacher wage increases. The language of “class struggle,” “ruling elite,” and “racial justice” was evoked in many public spheres, in a way not witnessed before. One teacher stated that this was a “righteous struggle towards the liberation of working-class people everywhere”. Others have commented on the racial aspects of this strike here. In relatively affluent West LA, the strike also proceeded with great enthusiasm. 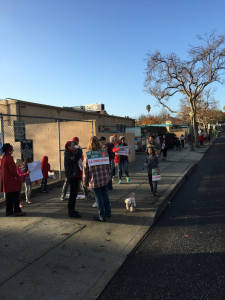 At one elementary school, teachers, parents and students kept up a spirited picket line, even on cold and rainy days. Some parents brought food and drink for the teachers, who were also invited to rest at a home near the school gate. Passing cars often honked in support, and no animosity toward the strike was expressed. Part of the reason the destination was the Broad museum is that Eli Broad has spent a lot of his time and money on neoliberalizing education in Los Angeles and promoting charter school expansion. This great “philanthropist” has opposed tax increases on the wealthy. He also donated over $2 million to secure a reactionary, pro-charter majority on the LA school board in the 2017 elections. Turnout was a dismal 17%, allowing Broad and his friends to basically buy the election. These pre-strike activities were very important in ensuring success and public favor in this struggle. While a fight for equitable wages is more than enough reason to strike, teachers saw this as a myopic goal. They understood that the district, the charter school machine and the media (Beutner is a former CEO of the LA Times) would put out a counter-narrative to suggest that vulnerable children were now at the mercy of uncaring educators who had walked off the job. Teachers are supposed to be altruistic, making it difficult to challenge anyone who appears to be working against the interests of kids. They knew that the lack of a cohesive movement and public buy-in would open the door for more school privatizers in the future who would employ the language of school choice to convince communities they are offering a better education, which of course they are not. Before this strike, the union and many grassroots organizations spent many weeks reaching out to their communities to discuss the full scope and nature of the strike. A grassroots organization working on this very issue emphasized the economic and social harms that come to children who do not have adequate services and offered local public education workshops on why/how charter schools exploit communities. It also worked with groups the union has historically had a difficult time reaching, such as undocumented immigrants. Finally, it mobilized and established a fund for striking teachers along with community resources for parents in need of childcare. 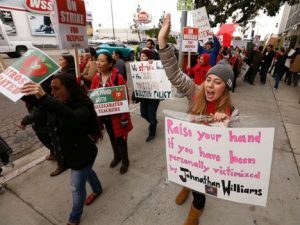 One charter school that has gained union representation by the UTLA, Accelerated Schools in predominant Latinx and African American South LA, also experienced a strike, which ended in victory after eight days, a little longer than the large public-school strike. In addition to wages and health benefits, these teachers won somewhat greater job security after having been subject to a harsh system where they were not notified until April if they were going to be teaching in the next school year. Many were let go without explanation at the end of each school year, helping to create a 50% turnover from 2016-18. On Tuesday, Jan 22, the last day of the strike, another layer of labor came onto the streets to support the teachers. 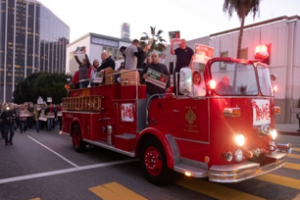 Some 1600 firefighters marched at 6AM alongside the UTLA “Red for Ed” marching band, along with a fire truck. They were in town from all over the US for a convention of the International Association of Fire Fighters. Over the past two decades, mainstream political forces have supported charter schools, whether rightwingers like George W. Bush, or liberals like Barack Obama’s Secretary of Education, Arne Duncan, not to speak of Democratic Governors Jerry Brown (CA) and Andrew Cuomo (NY). The charter school lobby has bestowed hundreds of millions of dollars in campaign contributions on these and other politicians that support them. 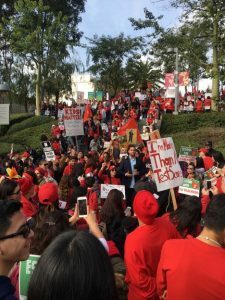 The LA teachers’ strike is a turning point in the defense of public education carried out by unionized teachers who have some autonomy, allowing them to raise the kinds of critical questions in their classes that create greater awareness of social issues and problems, without fear of arbitrary termination. While control over new charters lies at the state level in California, the teachers succeeded in forcing the previously pro-charter LA school board to pass a resolution calling upon the state government to stop new charter schools in the district, where at present they control about 20% of the students. This vote, carried out over the objections of 1000 angry pro-charter demonstrators, suggests that the worm has turned in terms of public opinion about charters, and not only in LA. Charter schools pay their CEOs (basically private owners of the schools) extremely high salaries, instead of putting the money where it needs to go. They also tend to teach to the tests (English and math only) so that they skew their “success” rates. Their primary focus is only English and math, since this is what the state of California is now requiring for competency. Charter schools only get state funds based on attendance and test scores. They’ll often have no physical education, no art, and no music programs, but they will still find money to pay for attendance officers to make sure every kid is in school every day. They can kick kids out for basically any reason, including illegal reasons (has an Individualized Education Program, usually for a disability) which means they keep the kids they want to make them look good. However, test scores overall STILL have not improved despite their own false reports. Most charters are non-union, which means high teacher burnout, something they cover up. Not having a union is also a way billionaires can chip away at union rights across all sectors, not only teachers, as anti-labor Wisconsin Governor Scott Walker did for eight years, until his stinging defeat last November. That said, there is a small, small fraction of charters that fills a needed niche in public education, but these charters tend to have unions, and are typically started by teachers or educational professionals that have an educational philosophy they believe works. These are not common and hard to run since it’s all about how much money you get per student that enrolls. 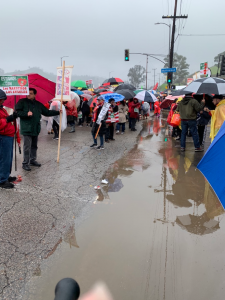 The LA teachers’ strike officially ended on Tuesday, January 22, 2019, with the district meeting some teacher demands. 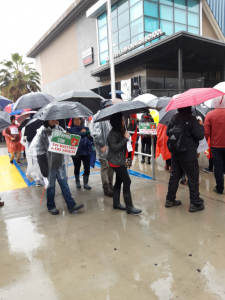 While there is somewhat of a public consensus that the district and the union came to a historic agreement, many teachers are not completely satisfied with the deal that UTLA negotiated on their behalf. The deal promises a class reduction of one student for every school year (two for special classes) and minimally increases the number of support staff, like librarians, nurses, counselors, and psychologists. The deal also includes some provision for expanding green spaces in schools, reducing standardized testing, and involving UTLA in decisions concerning the accountability of charter schools among others. Public schools are important sites for struggles for both students and workers, be they teachers or support staff. 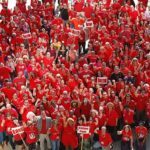 The #redfored wave continues with public schools in Colorado, Oakland, and Virginia preparing to take action in their bid to save public education. But what is the relationship of these teachers’ strikes to the larger struggle for a humanist alternative to capitalism? Public school is an extension of the bourgeois government, an institution that often serves dominant class interests; nevertheless, it is very much a compromise born out of the struggles of working-class folks. What that means is that we have to theorize what school can be in a new society. It also means that means we consistently fight for and defend public, free, and secular education. The mass teachers’ strike in LA and the equally massive community participation it generated show that the working people of LA want to defend, expand, and improve public education for all of our youth. The scent of a larger change also hangs in the air, as both the teachers and the community now view themselves in a new way, as empowered drivers of positive changes in our educational system. 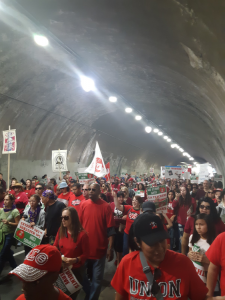 Will a well-organized labor union like UTLA, now under the leadership of progressives, continue and deepen the struggle, helping it to spread across the state and the country? Will UTLA find more ways to reciprocate the support it received from some of LA County’s most oppressed sectors — low-wage service workers, for example — by using their organizational resources to help these workers to gain union representation? Will UTLA speak out more forcefully on issues around Black Lives Matter or the movement to abolish ICE? Will the teachers find a way to speak out on capitalism itself, even as they rightly concentrate their fire on some of its most hypocritical and noxious local representatives, like Beutner and Broad? Originally posted at The International Marxist-Humanist. Kevin B. Anderson is a California-based sociologist and Marxist humanist. He is Professor of Sociology, Political Science and Feminist Studies at University of California, Santa Barbara. 1 Pings/Trackbacks for "LA Strike: Self-Mobilization of Workers and Communities"